Katarina and I watched The Trouble With Angels today. It is a great 60s flick about a Catholic girls boarding school. 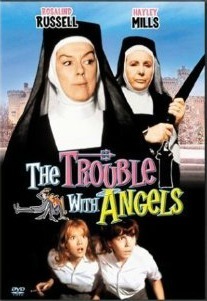 Rosalind Russell plays the Mother Superior, and Hayley Mills is a trouble-making student. Each of Haley Mills' escapades start with the pronouncement, "I have a scathingly brilliant idea!" At one point in the movie, the Mother Superior stops by dance class (the dance teacher is played by Gypsy Rose Lee, which brings up a whole different conversation), and realizes that the girls are lacking certain undergarments. Mother Superior tasks a particularly nervous and timid nun to take the girls to a lingerie shop, so they can buy said brassieres. Nearly in tears, she says, "But Reverend Mother, I don't know anything about...binders!" And that is all I have to say about women and binders. Do you have a favorite old or classic movie? We have been talking about this today on facebook - discussing how old a movie should be to consider it old. And if the age of a movie has anything to do with it being a classic. I loved this definition from Denise, "A classic doesn't have to be old. It just needs to be timeless and enjoyable, or relevant for more than one generation." I love love love love this movie. Even the second one they did with Susan St. James!! I love the second one too!! I love this movie! When I was younger, I was obsessed with Haley Mills and this was my fav. There are so many classics from all different decades that I love. The Philadelphia Story, Bringing up Baby, The Breakfast Club, Sound of Music, Forest Gump, the Goonies. I think a movie night is in order. I went through a Haley Mills obsessed time of my own. That is how I got hooked on Saved By The Bell - that first year when it was the Miss Bliss show and she was the teacher. The Philadelphia Story - Thomas and I have watched it so many times that we have the entire thing memorized. If you ever need someone to quickly stage a play of The Philadelphia Story, just call us. I love the rest of your list too. Movie nights are always good! I love these movies. Now I have to go watch it on Netflix. If you haven't seen it, it's available for streaming on Netflix. How awesome is that!? I don't have Netflix, so I had no idea they were on there. That makes me happy. Oh man! I done forgot all about this awesome movie!! I have this movie and it is one of my favorite's! Wanted to say thanks for stopping by my blog. I'm going to start saying I have a scathingly brilliant idea all the time. I can't wait.